Charles Blondin, was famous in the 1800’s for walking across Niagara Falls on a tightrope numerous times. He crossed blindfolded, with a stove and on one occasion he even cooked an omelette on the tightrope! In June 1859 he crossed with a wheel barrow and then asked the crowd if they believed he could push someone across in the wheelbarrow and the crowd shouted back enthusiastically ‘YES!’ To this Blondin replied, ‘Would someone like to step forward and get in the wheelbarrow.’ No one responded. No one trusted him. Blondin proved that day that there is a massive gulf between belief and trust. No one trusted Blondin enough that day to get in the barrow! It is the same with our lives spiritually at times. God doesn’t want us to just believe – He wants us to trust Him!! Solomon was the wisest man who every lived and so we would be wise to take on board not just Solomon’s wisdom but also remember that it comes from the God. Imagine if you really lived out this quoted verse? You might step out – build a business, new career, launch a ministry or even write a book! If we trust God like we never have before – we will live like we never have before! Father God longs for you to really trust Him and no matter how much you already trust Him, to enlarge and increase your capacity to trust Him. ‘Did God really say’ was the challenge the devil gave and, to be honest, he’s continued this ever since. ‘Did God really say’ has been the Devils catch phrase! He has subtly sought to undermine God’s Word to His people ever since! He has sought to undermine the promises AND the consequences of failing to obey God! Trust levels are at an all time low! Even friends and family members let us down. A Readers Digest survey of most trusted Americans – reported that President Obama came 65th and the actor, Tom Hanks, came 1st! We just don’t trust anyone and consequently we don’t trust God….there has been an erosion of trust! Everything we do in this world flows from that relationship of trust with our wonderful creator and Father – God. We were created to TRUST GOD! Deeply! Unswervingly! Totally! We simply have to re-connect and begin to really trust Him. Once we do, I believe we will see a transformation of our lives, relationships, marriages, finances, jobs careers, ministries, hopes and dreams. In fact every single area of our lives will become transformed. We will mature, develop, grow, become fruitful and we will become fulfilled in ways we could never have dreamed of. Trust is the issue. Trust has been eroded. The result being that we struggle to trust our God or believe what He says in his word. Can I encourage you, in spite of your experiences, what you’ve seen and what others have done – to start to really trust God again. A few years ago Julia and I were holidaying in Wales on the beautiful Lleyn Peninsula. A lady we met suggested that we visited a place called Nant Gwrtheyrn where we would find a secluded quarrying village overlooking the sea & coffee shop. We were warned that the route down was very steep however we decided to visit. When we arrived at the top of the hill and looked at the narrow winding road down the hillside both of us looked at each other anxiously! (Julia more than me as I was the one behind the wheel!) We decided to continue down this incredible scenic route among the trees with a several hundred feet sheer drop on one side. Eventually, with hearts in our mouths, we made it to the bottom. I was glad that the week before the holiday my car had been fitted with new brake discs and pads! Have you learned to trust, yes, really trust God yet? So who are you trusting in? Is your trust misplaced in someone else rather than God? Often our trust is in our own abilities, skills, bank balance, spouse, friend – anyone or anything other than God. Make a choice today to trust in God. The Hebrew word for trust is ‘bâṭach’ which means ‘properly to hide for refuge; figuratively to trust, be confident or sure.’ To trust in the LORD with all my heart means to hide in Him for refuge and to place all my confidence in Him. Solomon had learned this for himself. Have you? We so easily let this well-known verse roll off the tongue but let’s recognise who this is we’re talking about – the God of the Bible, of Abraham, Isaac and Jacob. Perhaps you’ve made your God to be too small to trust fully? He is the TRUTH, His Word is truth and He is trustworthy and totally consistent in all He does. He has a track record! When you don’t understand what’s going on in your life and God appears silent – remember to trust in the Lord. Trust in the one who is faithful, consistent and true – the One who is good all the time. He is not human like us – blesses one day and curses the next, loves one day and forgets the next. He is trustworthy!! 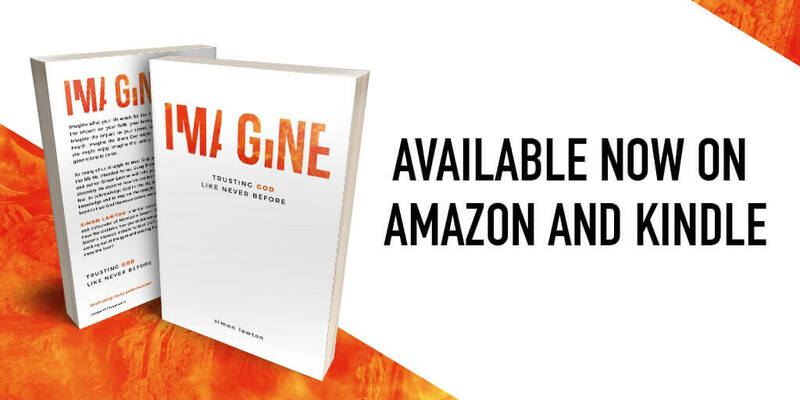 If you’ve enjoyed this post you might like to check out my book entitled ‘Imagine’ that is all about trusting God available now on Amazon and Barnes & Noble plus other major book sellers. 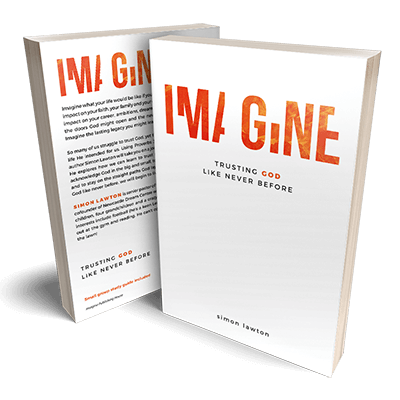 In ‘Imagine’, I will help you to explore what your life would be like if you really trusted God. My objective is to help you imagine the impact on your faith, your family and your other relationships. To imagine the impact on your career, ambitions, dreams, finances, health and to imagine the doors God that might open and the new adventures you might enjoy. You could also imagine the lasting legacy you might leave for the generations to come. So many of us struggle to trust God, yet this is the key to discovering the life He intended for us. Using Proverbs 3:5-6 as my core text, I will take you on a journey of new faith and discovery. We will explore how we can learn to trust God fully, to overcome fear, to acknowledge God in the big and small, to trust in His infinite knowledge and to stay on the straight paths God lays out for us. If we learn to trust God like never before, we will begin to live like never before!